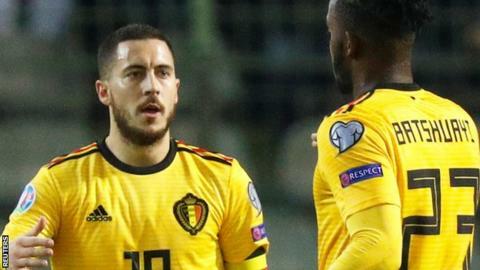 Chelsea's Eden Hazard scored twice to spare the blushes of former club-mate Thibaut Courtois as Belgium began their road to Euro 2020 with victory over Group I rivals Russia. Leicester's Youri Tielemans' low shot gave Belgium a 14th-minute lead. Second yellow card to Aleksandr Golovin (Russia). Fedor Chalov (Russia) wins a free kick in the attacking half.